The Steigerwald think tank works 24/7. We are constantly striving to enhance and optimise our equipment or think up clever new ones. The development of our portfolio is an ongoing process. Take a stroll through our webshop. You will be amazed about the multitude of options you have to promote your horse’s health and wellbeing. Maybe you ask yourself: what can there possibly be optimised about seesaws? Don’t they just have to go up and down? There is much more to this kind of movement than might be obvious at first sight. The design of our physio seesaws focuses on an efficient and, at the same time gentle muscle formation. It is vitally important to combine these two aspects and stimulate growth without causing damage to muscle tissue, tendons or ligaments. 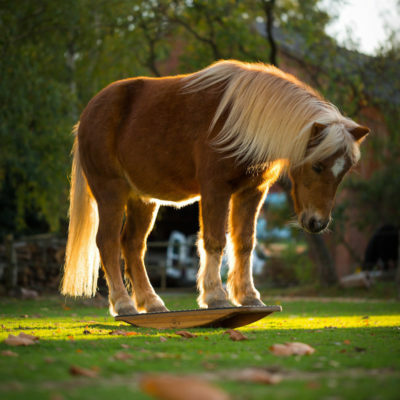 With this goal in mind we tested and re-tested our seesaws repeatedly with a variety of horse types over a long period of time. We involved vets, horse osteopaths, physical therapists and trainers from many different sections of equestrian sports. 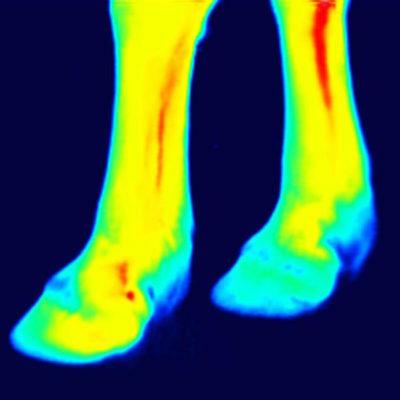 In 2018 we used thermographic imaging to visualise the benefits of seesaws for muscle improvement. We pour our hearts in this task, because the health of all our horses is at stake. And this is merely one aspect of a bouquet of benefits you will find in our seesaws only, and nowhere else. Pectoral muscles before the training session. Pectoral muscles after the training session: It is impressive to see the immense increase in blood flow! Front legs before the training session. 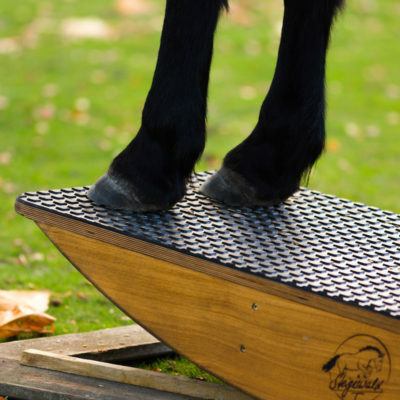 Front legs after the training session: We see a tremendous increase in blood flow not only in the front legs but in the hooves as well, simply by training with the Steigerwald.Training & Therapy equipment. Steigerwald.Training & Therapy equipment is designed to enhance the health and wellbeing of your horse, and not jeopardise them. 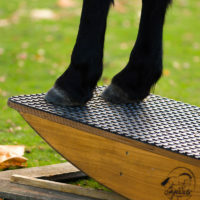 Therefore, all training devices have rounded corners, carefully smoothed edges, and a closed structure, so that the horse’s hooves cannot get tangled or stuck in case of a slip. We only use high quality material in an exceedingly sophisticated manufacturing process to ensues the highest possible safety level for our beloved animals. We go to such lengths, so you can have unrestricted fun and carefree training sessions with your Steigerwald.Training & Therapy equipment. Training and fun for you and your horse, a plethora of benefits included! There are a thousand more facets and benefits of our equipment. For more information about the characteristics of our devices go to the detailed article descriptions in our onlineshop. For descriptions of possible applications and usages refer to Nina’s blog. 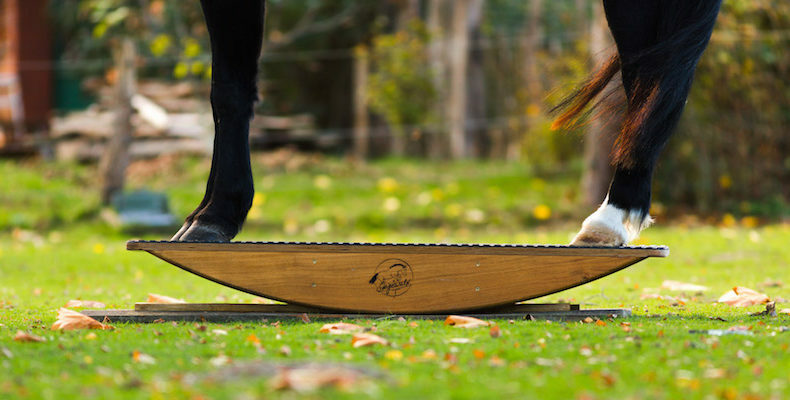 Want to know how to teach your horse to walk on a wooden training bar (a horse’s equivalent to a tightrope)? How to use its belly and hind quarter muscles on a seesaw instead of simply bobbing its head up and down? Then go to Steigerwald.Training the animal friendly way.